Fallout Shelter shocked many people when it reached the top grossing charts. Many (including myself) have been preaching about the unchanging stasis that exists at the top of the AppStore, and Bethesda came in and changed that completely. I don’t think anyone can doubt that the brand of Fallout was huge for this launch. 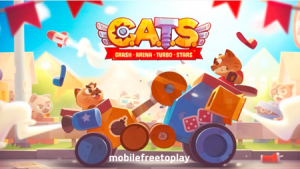 It attracted loyal gamers and drove massive organic growth on the AppStore. Every game studio since the launch of Kim Kardashian by Glu has known this. To make marketing on the AppStore affordable, brand recognition is becoming more and more important. But the marketing aside, what shocked me was the response from players to this game. Here is a game that was developed by a traditional developer, taken a brand many gamers love (as a premium title), and then changed it completely to be free to play. We have seen this many times before ending poorly (see Dungeon Keeper, Sonic the Hedgehog). So what was so different about this launch? 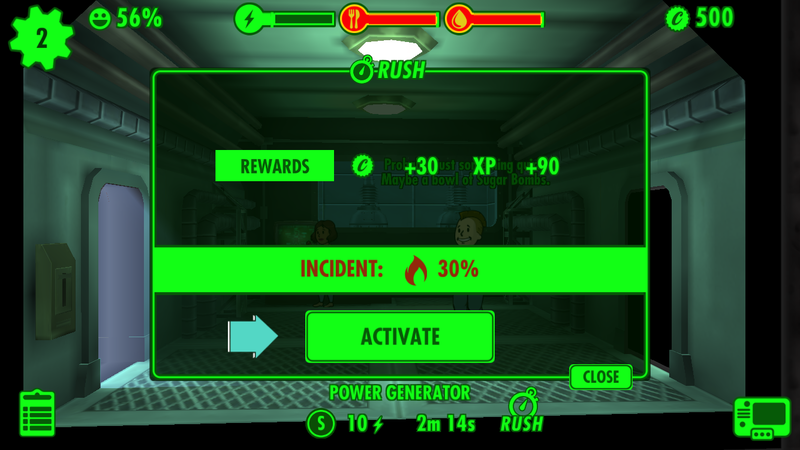 How did Fallout Shelter become a beacon of acceptable free-to-play design for core gamers? 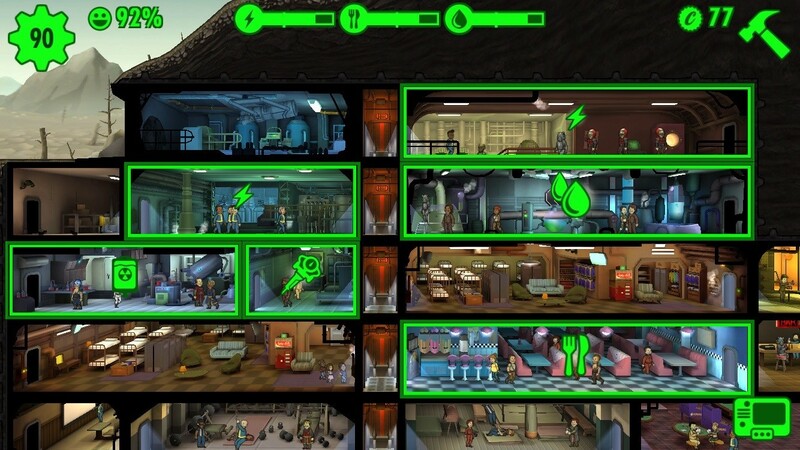 Fallout Shelter never forces its players to leave. There’s always something positive to do with your vault. There’s no blocker such as energy which says “you must leave now”. But as we’ve seen in previous posts (here and here), having a limit on sessions and progression is absolutely necessary to drive long term retention. Fallout Shelter employs what I like to call “Flexible Sessions”. The player enters the game, feels rewarded, but the game slowly increases the pressure to leave. Instead of having an abrupt end to the session with energy, Fallout Shelter slowly tweaks the gameplay so you as a player feel smart for leaving. This is the typical screen the player returns to each time they come back to the game. Lots of rooms with lots of resources to collect. It feels very rewarding to return to the game every time. Each time the player enters the game there are a ton of things to reward them. Production timers are short, so coming back every 5-10 minutes rewards the player with lots of resources and some occasional level ups of their dwellers. However, the longer the player remains in the session, the less rewarding the game is. This is built intentionally so that players eventually opt-in to leaving the game. You want to build session design so that the player feels smart about leaving. Not told to leave. A good example of the game increasing pressure over a session is the “rush” feature. Rushing takes the place of a “skip for premium currency” button which free to play games have. For fallout, the rush feature is no longer a monetization feature, it is a session design feature. In the beginning, the player is trained to continually rush production of rooms. This rewards with faster resource production and bottle caps (a key currency for progression). However, the more you rush a single room, the higher the incident chance will go up. So the more you rush rooms, the more likely a fire or radroach attack happens. The longer you are in the session, the more rooms you rush, the higher risk you have of bad effects. It is strategic to leave and come back later. Overall the game never really forces the player to leave. Just tries to slowly decrease the value of sticking around. So for core gamers, they never feel like they are being pushed out of the game for no apparent reason, rather they are making strategic choices about when to stay and when to leave. We can all read from the reviews, forums, and rants that gamers hate timers, pay-to-skip and energy systems. But pacing is the key to long term retention. Without long term retention, a free to play game can’t succeed (more on this here). So how do we effectively pace traditional gamers? Disguise the pacing systems to feel different from traditional free to play systems. Best example of a disguised free to play mechanic is the wasteland mission system. This system is a version of FarmVille’s “plant and wither” mechanic which drove very strong commitment for players to return. Each time a player would plant a crop, the crop would have a limit of how long it was harvestable. If the player didn’t come back before this time, the plant was withered. The player would not get any value from it. Plant and wither hasn’t been around for awhile because most designers see that player’s really hate it when their first experience coming back to the game is to be punished for not returning. Punishing players at the level of FarmVille these days results in a high churn rate (a high percentage of players leaving the game). But Clash of Clans, Boom Beach and other “Build & Battler” style games have slowly added this punishment back into the toolkit for free to play design. The longer the player is away, the more likely they are to be attacked. When they’re attacked, their precious resources are being stolen. This fear of losing out on owned items, or “loss aversion”, is a very strong session driver. 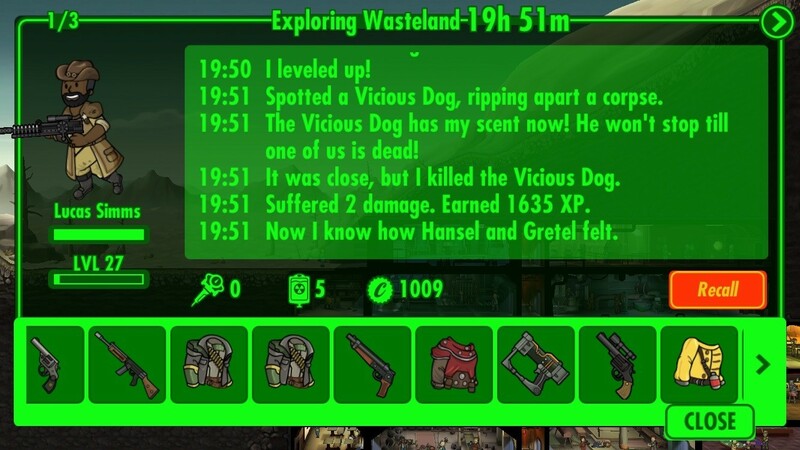 Fallout Shelter employs loss aversion with their wasteland feature. Unless the player comes back to the game before the dweller dies in the wasteland, that settler is dead. All those bottle caps and rare equipment the dweller collected? That’s gone too. Of course the player can revive the dweller, but this comes at a cost, which rises over time. “Smart” gamers are going to feel good about scheduling their day around avoiding deaths of their dwellers. For addressing the core audience, designers will have to reverse engineer common pacing systems and rebuild them to feel something very different. The wasteland feature is an excellent example of how to do this. Lastly, targeting their Fallout player audience, Bathesda knew they needed a fair monetization scheme. The only way to do this is with a Gacha/Card system (more on Gacha here). Fallout Shelter offers no direct purchase of resources. This is the usual method for simulation games. Drive desire for the player to spend when they’ve run out of a specific resource they need. Fallout Shelter does it differently. Instead of the much-hated resource store, they have a lunchbox gacha system. Each lunchbox contains a random set of cards. Cards can be resources, soft currency, gear, or even rare dwellers. 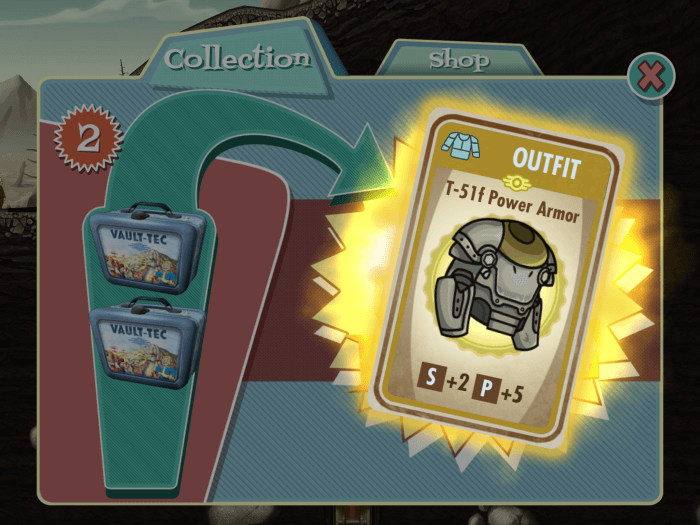 So instead of knowing exactly how much currency you’re going to get, you have the rare chance that you’ll get a rare dweller or rare gear on top of the resources you need. Thus paying for items feels very rewarding versus paying for currencies in other games. You don’t feel like you’re cheating the game (as much) instead you feel like you’re playing the lottery and being rewarded with new toys to play with. The key that makes this core-gamer friendly is that it is fair because it is luck based. Any player has a chance at the big rare prizes. It is fair because all players can get lunch boxes from regular play. Playing the game smartly can get you lunchboxes quicker. 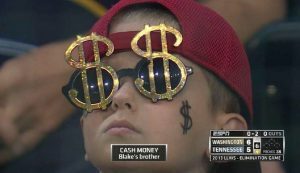 It also feels fair because the players that pay aren’t really impacting any other player’s experience with the game. Fallout Shelter is not operating in a PvP multiplayer environment. If they were, there would be a lot of pay-to-win criticisms. Because the game is single player, Bethesda had some wiggle room with these pay-to-progress mechanics. Hearthstone and Contest of Champions has shown that these gacha systems can give lucrative monetization potential. However, the revenue per download of Fallout Shelter over the last few months is much lower than most top grossing games. But when you consider the downloads the game got simply because it took a lighter approach to monetization, this was probably the best choice. Monetization methods have far more to do with what your audience expects, rather than what would be the best way to make a buck. Despite the all that I’ve praised here, the game ultimately did not sustain in the top grossing. While it initially had the support of the brand, ultimately the game didn’t stick to the top charts because of the lack of content, not pacing players enough and no social gameplay which led to low long-term retention. From discussing with high level players, the game really only lasts for maximum 2 weeks. After this, there is no new rooms, no desire for more dwellers, no new content. No goal to achieve other than optimizing your vault’s layout. For free to play to truly work, your game must last for months (if not years). So why should you start even considering emulating what fallout shelter built? Why should we care what core gamers think of our game? It comes down to your audience, and knowing what they expect and what they tolerate in free to play mechanics. Games for players of mass market match 3 games require different techniques than games for players of fallout. What fallout shelter has shown is that the core gaming audience can be a big game changer for free to play games. This audience can grow a game overnight that can take over the top grossing charts. This audience is very likely to be the ones playing your game for months, competing at the highest level. Research is showing that the big spenders on mobile aren’t new game players, these are players that have experience playing and paying for games. Gamers have money and are willing to spend it on games that they feel treat them fairly. So as a developer, if you’re going for a more mid-core or core audience, you have to ask yourself: What did Fallout Shelter teach you?